Born Performer: A Vermont Teen Spends Her Summers in the Circus | One to Watch | Kids VT - small people, big ideas! Circus Smirkus, Vermont's award-winning international youth circus, trains kids as young as 5. But Ariana Wunderle started practicing with the troupe when she was just 3 years old. The tall, wiry 13-year-old has a special connection to the organization — her parents help run it. Over the years, they've had various positions there. Her dad, Troy, is currently its artistic director; her mom, Sara, is assistant operations director. Ariana's parents may be in charge, but the seventh grader has proven she has what it takes to succeed in her own right. 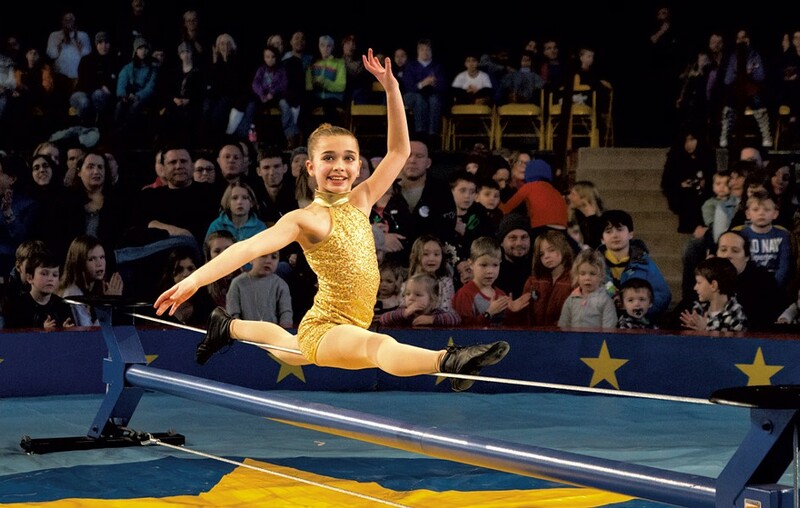 An accomplished gymnast, she has been invited to compete in the Vermont State Gymnastics Championship nine times; eight of those times she was one of the top five contenders. Several years ago, she decided she wanted to be a tightrope-wire walker, so she spent hours of her free time practicing and training, "just to get the basics down," she said. In 2014, her wire-walking routine earned her the grand prize in the Vermont Has Talent competition. Until she was 10 — the minimum age for traveling Circus Smirkus performers — Ariana toured with the group as a "trouper-in-training." This summer, she'll perform as a wire walker, aerialist, partner acrobat, trumpet player and clown in the Big Top Tour. "I like being a clown," Ariana says, "because you can basically tell the audience what emotion you want them to be feeling." Her training regimen is far from clowning around though. Ariana adheres to a demanding weekly schedule, which includes three days of gymnastics, two two-hour sessions of circus training and one private lesson with a circus coach weekly — on top of daily field hockey practice with her school team in the fall. Sara and Troy say performing in the circus has allowed Ariana to shine as a person and helped her develop poise and maturity. They explained that the Troupers — the name for members of the touring company — come from all over the world and have exposed Ariana to many different kinds of caring, outgoing people who are passionate about what they do. When school lets out in June, Ariana will head to Circus Smirkus headquarters in Greensboro with the rest of the performers. The 20 Troupers, who this year range in age from 12 to 18, will spend three weeks designing the show and practicing their acts. The kids "take ownership of it, but not too much," explains Troy, who trained at Ringling Bros. and Barnum & Bailey Clown College. "We still want them to be kids." Once the production is ready for prime time, the group will hit the road for seven weeks, traveling throughout New England and New York, with days off between performances to hit the beach, mall or movies. They'll wrap up the season back in Greensboro with two final hometown shows. 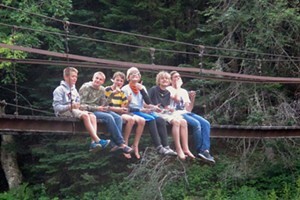 Then the kids will pull an all-nighter, to reminisce about the summer and say their goodbyes. Though Ariana says she misses her school friends during summer vacations, she also sees the value in what she's doing. "I'm surrounded by people with the same love and desire," she said. "We're one huge family." The 30th Circus Smirkus Big Top Tour starts in Greensboro on July 2, then rolls into Waitsfield on July 5 & 6, Essex Junction on July 8 & 9, St. Johnsbury on July 14 & 15, and Montpelier on August 16, 17 & 18. The final shows take place in Greensboro on August 20. Visit smirkus.org for details and to buy tickets.